Can You Ship Art in Heavy Duty Plastic Crates? No one will argue with the fact that heavy duty plastic crates are useful for a variety of purposes. 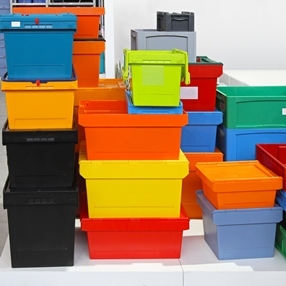 In particular, they are pretty good for many storage- and shipping-related needs, and can be used as an alternative to standard cardboard boxes that can easily break due to degradation or simply because they were made to hold lighter items than expected. Besides, many heavy duty plastic crates are weather-resistant and very strong, not to mention that they can be used over and over again. Plus, such crates are cost-effective, which makes them a preferred option for many. However, the question is whether you can use heavy duty plastic crates for shipping art and other valuables. While heavy duty plastic crates have lots of advantages, the truth is that they are not intended for shipping fine art and antiques. As professional shippers of fine art, we deal with numerous valuables and collectibles, and we know how fragile and delicate these items can be. For this reason, we highly recommend everyone to use wooden crates instead of heavy duty plastic crates when moving artwork of any type. After all, even standard economy wooden crates provide much more protection to the transported items than plastic ones. Thereby, if you do not want to get your precious possessions in pieces, think twice when choosing shipping crates for your art! Once you understand that heavy duty plastic crates are not an option for shipping fine art pieces, you need to find a reliable art packing and crating service. Luckily, Fine Art Shippers offers a variety of solutions to meet any budget! Moreover, whether it comes to open crates with wooden framework, storage crates, or premium quality museum crates with custom interiors, we do everything in-house in our own fully equipped warehouses. Besides, since we are proficient in handling art pieces of any size and weight, you can rely on our team to pack, crate, and ship even oversized sculptures, large musical instruments, and other bulky and oddly shaped items. One more important thing you should know about Fine Art Shippers is that we offer affordable rates for all our packing and crating services, so please do not hesitate to contact our team even if you have a limited budget. Hopefully, this will help you make the right choice when deciding on whether to choose custom wooden crates or heavy duty plastic crates for shipping art and other valuables!